How to change the data and properties on a Jpeg, Tiff or RAW image file format? If you’re searching for a freeware that does simple exif editing, look no further. Microsoft Windows Explorer has the capability to edit exif data. You can change the description, tags, authors, copyright information, data modified and many more. However, for those looking for a more powerful metadata editor, this article has a simple list of freeware that enables you to change exif data of photos. 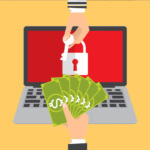 Just for your information, photo metadata allows information to be transported with an image file, in a way that can be understood by other software, hardware, and end users, regardless of the format. By modifying these metadata, it doesn’t mean you have successfully fooled the police, there will always be digital breadcrumbs that is traceable. 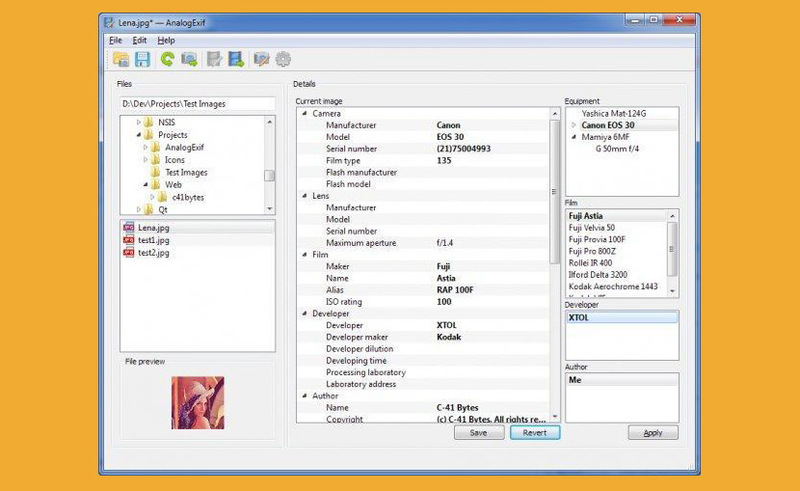 AnalogExif is a free metadata editor for the scanned films and DSC-captured digital images. Modification of the most EXIF, IPTC and XMP metadata tags for JPEG and TIFF files. 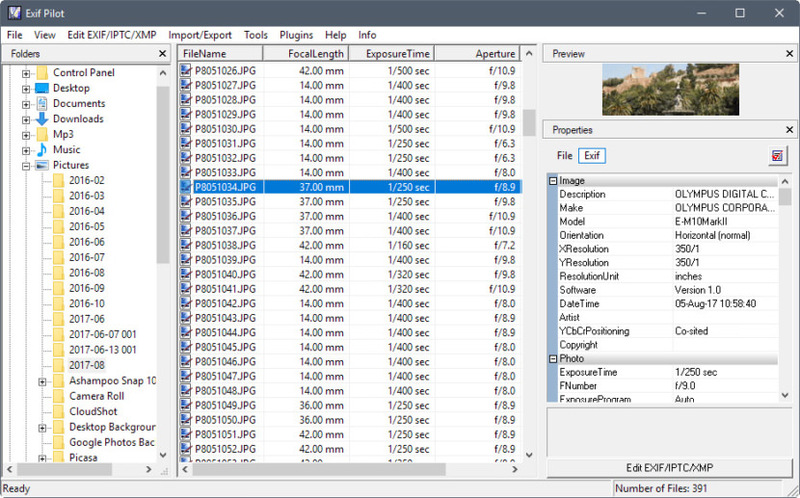 This is perhaps one of the most powerful Exif editor. 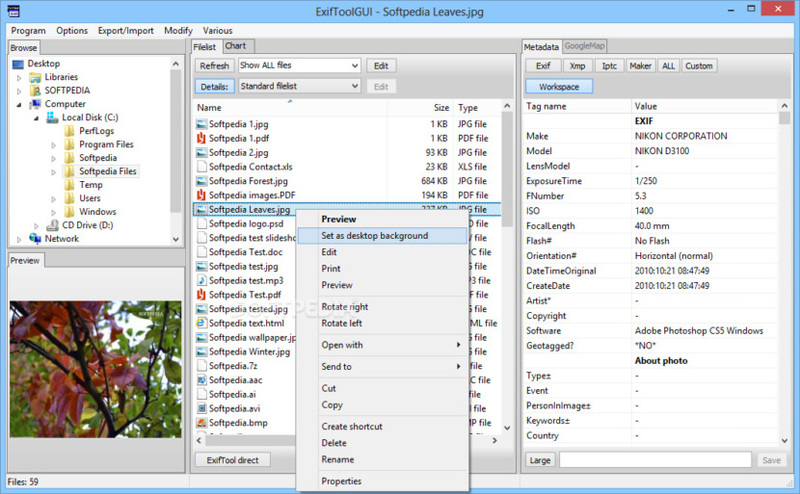 Runs on both Microsoft Windows and Mac OSX, ExifTool is a powerful editor that reads, writes and edit meta information in a wide variety of files. ExifTool supports many different metadata formats including EXIF, GPS, IPTC, XMP, JFIF, GeoTIFF, ICC Profile, Photoshop IRB, FlashPix, AFCP and ID3, as well as the maker notes of many digital cameras by Canon, Casio, FLIR, FujiFilm, GE, HP, JVC/Victor, Kodak, Leaf, Minolta/Konica-Minolta, Nikon, Olympus/Epson, Panasonic/Leica, Pentax/Asahi, Phase One, Reconyx, Ricoh, Samsung, Sanyo, Sigma/Foveon and Sony. Exif Pilot is a Free EXIF Editor that allows you to manipulate META data within image files. The free version doesn’t comes with batch processing, you’ll required to pay a small fee for the addon plugin. 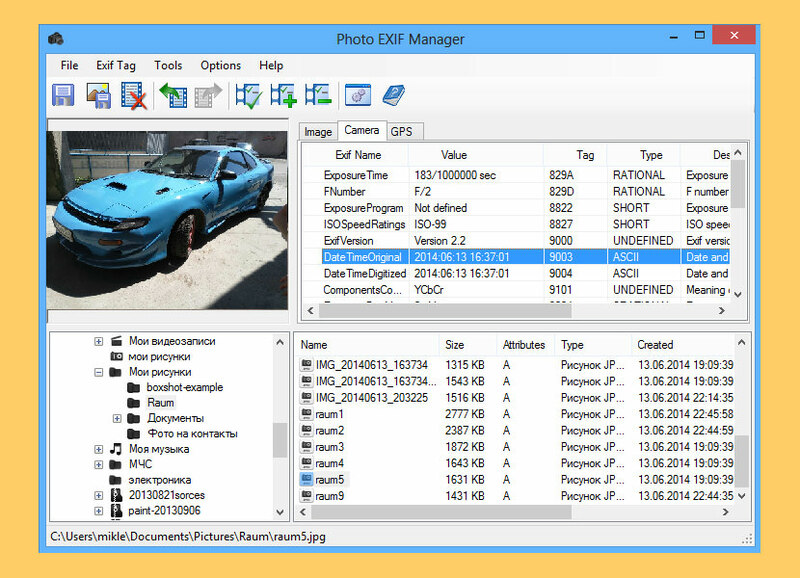 EXIFManager is a free software that allows to quickly enter image description / user comment / author on a set of picture, inside the EXIF data and also to rename pictures files using EXIF data and a powerfull format editor. Metadata++ is a powerful yet easy to use freeware tool to view, edit, modify, extract, copy metadata of various files formats. Metadata++ is designed to be as fast as possible: quick navigation among directories, fast directories reading, fast and smooth painting of panels and thumbnails. Metadata++ is portable, it is configured to store all configuration and settings in the same folder that it is run from. Almost all digital cameras record and store various camera settings, scene information, date/time the photo was taken etc as Exchangeable Image File Format (EXIF) data. This metadata is stored within the image file and won’t get lost or overwritten when copying or transferring your photos to other computers. EXIF Date Changer Lite enables you to quickly and easily adjust the date/time taken on your photos and scanned images. 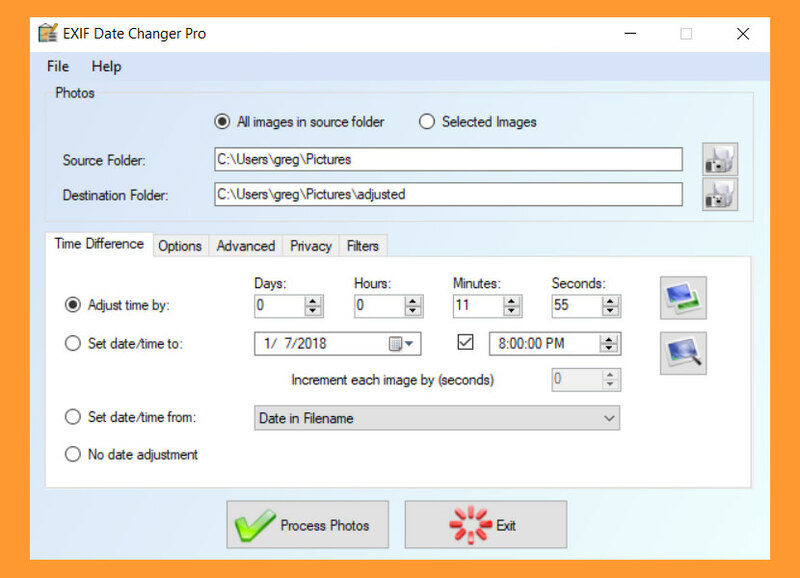 Adjust or set the ‘ date time taken’ of your digital photos – Compensate for incorrect camera settings or different time zones within seconds across an entire folder of images. 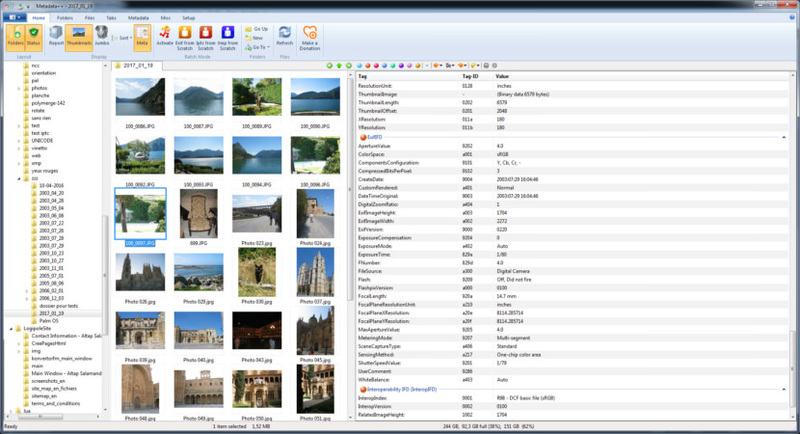 Process selected images or batch process entire folders of images – Quickly and easily select the required images by either selecting a folder or individual images. Why to fake camera details? I believe it’s better to delete them with the help of tools such as EXIFCleaner by Superutils, instead of putting inaccurate data. Having scanned photos that are about 60 years old, I don’t want the scanned date (ie today) as date taken. I use an exif editor to add GPS and tags. Sure, I could do it in Lightroom, but if the Lightroom catalog becomes corrupt, I lose all that data. When I put photos into my girlfriend’s photoframe, the orientation is wrong, despite rotating on the computer. I need to get into the metadata to change the orientation there. are there any good Free Exif Editor? Hi. If you are using windows, Quick Exif Editor. I am now trying to find a decent one for my Mac. are there any more Tools for Reading and Editing Exif Data of Photographs apart from this? thanks! How to change the data and properties on a Jpeg, Tiff or RAW file format? EXIF Date Changer will update JPEG and RAW file formats but for batch updating of many files at once, it does require the Pro version. 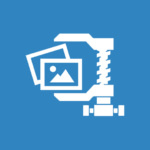 how can i change exif data in windows 8? You can also use KrojamSoft PhotoViewerPro. You can choose from wide range of eye-catching effects! And control the intensity of Looks…..
You are a group of gentlemen and are of good will. “Some” men are not and take photos to “prove” they are somewhere (at a store) when they are in fact cheating in some way. If I have received 100 photos, all with exif data, and then all of a sudden receive a random shots while he’s “grocery shopping” or “working out” that are stripped? Why hide when there is nothing is to hide? Just: “wow”! Your indicating AnalogExif was a real life saver for me, as I’d spent the last couple of hours searching for something that did all those settings (ISO, aperture, etc.) and I either ended up stubling upon someone’s recommendation of ExifTools (which, though a great tool, didn’t have anything in its documentation saying it could do just that) or some defunct hybrid Android/iOs-Windows app. I’m very suspicious of a particular sample image on the Canon website, regarding the 5DS – 50 megapixel camera. There is an image taken from (most likely a helicopter) , of Yokohama, Japan…its clarity and resolution is beyond even what an 8×10 film camera could do. I’ve worked with large format field cameras for over 30 years. It’s simply impossible resolution. I have printed this image out at 54×36 inches. It’s not to be believed. Thus, i don’t trust the exif data in this image. Could the exif metadata have been altered? I do not want to spend $5,000 on this camera, only to be duped in the end. What is this? ExifTool, when I followed the instructions, flashed a command window for 1/10th second and that was it. Useless. That’s 2 of 3 now. Is there any way to recover pictures which were regained by recovery tools after previously deleted. Now pictures are “unreadable”. I expected that internal data structures are partially deleted. Since they have a quite large size so I think it may contains most of the HEX data. Best program hands down is the GEOSETTER! Totally free but you are welcome to donate. I use it to help people with massive photo libraries that need EXIF data updated with information on photos taken before this information was embedded. Then when importing to Google Photos, Google Photos is able to read location data etc. Bulk editing and ability to create favorites to apply to large quantities of photos! XnViewMP a better tool, for managing metadata . I’m looking for a plugin that lets me edit/remove EXIF data into WordPress. 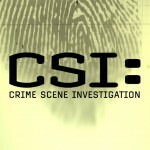 Is there a plugin available for that? There are plugins that remove exif data when you upload, as for after you upload, I am not sure. 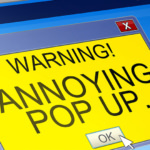 Don’t have software portable for windows? You can also change EXIF data on your images using Namexif.